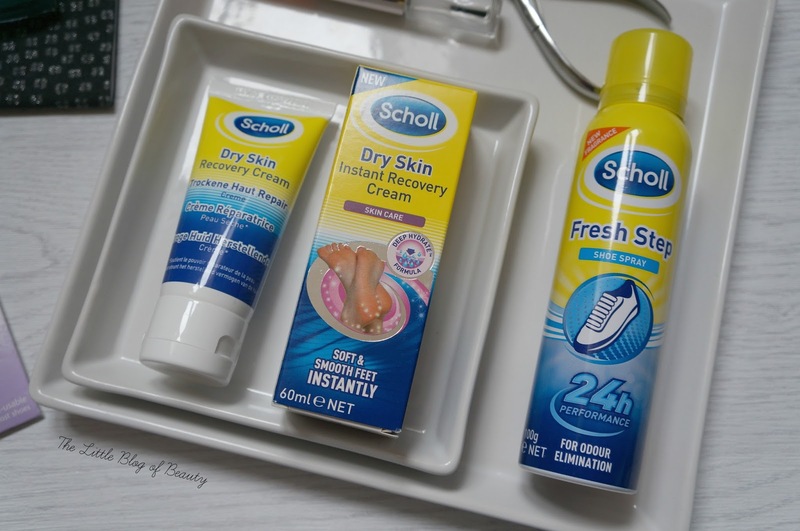 Scholl foot care - Dry skin, smelly shoes and sore feet! Although I do take care of my feet in the summer when they're on show in sandals I do tend to forget about them in the winter when they're wrapped up in socks and boots. So I gratefully accepted a foot care package from Scholl to help me look after my feet this winter. I was sent the Dry skin instant recovery cream*, Fresh step shoe spray* and the Party feet ultra slim invisible gel cushions*. I don't suffer from smelly feet but what I do have a problem with is smelly shoes, which mostly affects my ballet pumps in the summer. I often have to throw away a perfectly good pair of ballet pumps that still have plenty of wear left in them because they've got to the 'too smelly' point, where you can't risk taking them off in public. I'm feeling so attractive right now! There's not a lot you can do about this as you can't really stop your feet sweating, but you can use something like Scholl's Fresh step shoe spray as a kind of Febreze for your shoes. This eliminates odour instantly and provides 24 hour odour protection and freshness. I've found that this is quite a wet spray, so it's not one to use if you're in a hurry and need to put your shoes on straight away as you will need to leave it to dry. I won't have as much need for this now we're in autumn but I'll definitely be stashing this away for next summer. Like most people I have to keep an eye on my heels or they get dry and rough and in no state to pop in some pretty sandals in the summer. As I've already mentioned I tend to forget about my feet in the winter but nobody wants nasty heels any time of the year. The Scholl Dry skin instant recovery cream contains something called Deep Hydrate which exfoliates dry, dead skin cells allowing moisture boosters to penetrate deep into the skin. What surprised me about this is that as you apply the cream it feels slightly gritty against your skin. I guess the idea is it lightly exfoliates the skin as you apply it. This is very light exfoliation though so it's not going to work miracles. If your heels are particularly dry I'd recommend exfoliating them first either with a manual scrub, manual file or one of the new electronic files, as if you do have quite a build of hard skin the cream won't get through it. Something I've always had a problem with is shoes hurting me. It doesn't matter what type of shoe it is, even ballet pumps will usually end up rubbing me somewhere. It's only normally boots I can get away with and even then I have had pairs of boots that have hurt me. I remember thinking years ago how amazing it would be if you could get some kind gel or something similar you could stick to your shoes where they hurt you to stop them rubbing. Somebody else must have had the same idea as me as I later discovered Scholl party feet. These are gel cushions that come in various different shapes and sizes with a sticky back so they can be attached to the inside of your shoes. I've been using these for years and they can be a real life saver. You can get them to go on sling back straps, under the balls of your foot, at the back of your shoe to stop it rubbing on the back of your foot and 'sore spots' which are small circles you can place anywhere in your shoe where it might rub. The sore spots are particularly useful for where my little toes are slightly deformed and sit curved outwards rather than flat (I'm so sorry if you hate feet!) and I use the heel shields in every pair of ballet shoes/pumps I own. Although the glue on them is pretty good I do find they usually come unstuck after a while but I then just add some super glue and then they're in there for life! Scholl products are available from Boots stores and the Boots website. What do you use to take care of your feet? 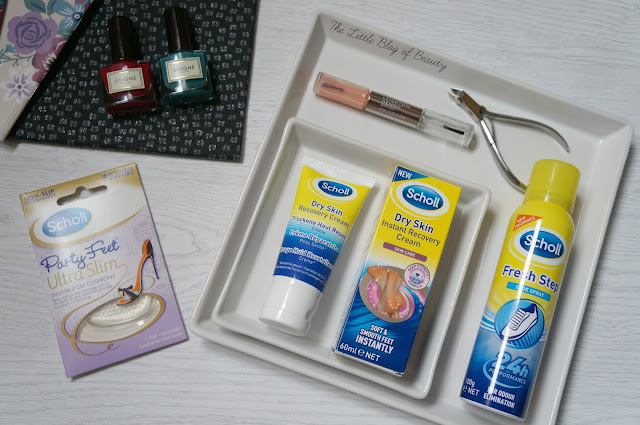 Oooh, I won a giveaway including all these products not so long ago. I use the shoe spray on my boyfriend, haha!